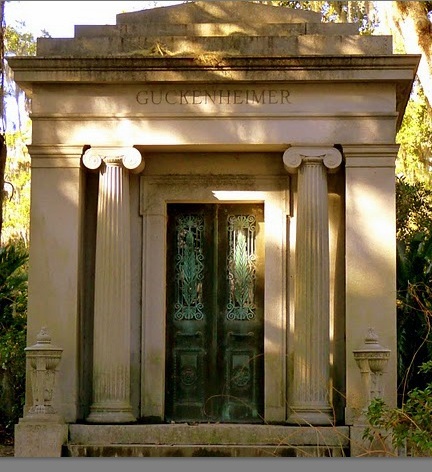 You wouldn't normally think of going to a cemetery to view beautiful works of art, but that's what we found when we visited Bonaventure Cemetery in Savannah, Georgia. The cemetery is filled with old live oak trees draped with Spanish Moss. Some graves had gorgeous wrought iron railings around them. This is the bluest hydrangea I've ever seen. It caught my eye as we were driving by. There's an area for war veterans, as well. I loved seeing the flags against the white headstones. Look at the drape of the gown across the steps...so pretty! We spent a couple of hours walking and driving around the cemetery, but we still didn't see it all. There were many small family mausoleums, as well. The doors on some of them were amazing. Pretty amazing, even if it is a cemetery! I admit, Savannah has some of the most amazing grave sites. They just dont make them that amazing anymore. I truly love these types of shots and history. Beautiful Pam! I love cemetery images. Thanks for sharing. Savannah is one of my most favorite spots in the world! I have never seen this gorgeous and art filled cemetary. I too find beauty in old cemetaries! Your photos are stunning. I've never been to the south, so I'm relishing these pics. The hydrangea?!? Oh my gosh - just incredible! Dropping by from Savvy Southern Style. I'm going to Savannah next week. I'm going to look for this beautiful cemetery. Such beautiful photos. Wonderful detail and design. I was going to go to our local cemetery next week and see what kind of photos I could get. I don't think ours is nearly as interesting! I have always liked visiting the cemetary for the beautiful works of art displayed there. Times sure have changed. I really enjoyed visiting here today and seeing beauty. The Hollywood cemetary here in Richmond, Va. is beautiful also with the mausoleums and even a tiffany in one that I saw. Will be back to look around. Savannah is on my bucket list.... I would never have thought of the cemeteries as "THE" place to visit... but, you're right. Totally amazing. Hi Pam! I'm your newest follower; found you via Kim's blog. Your photos are stunning. I love old cemeteries. Savannah offers some great ones. Pam, everything in Savannah is pretty even the cemetaries. I just love those old head stones. Thanks for joining WUW.